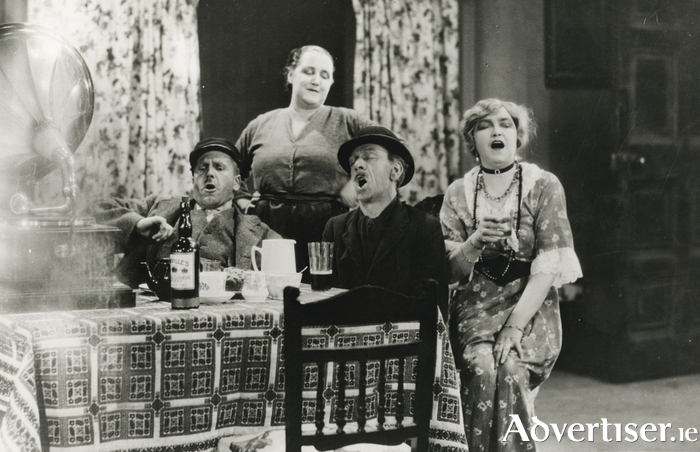 A scene from Alfred Hitchcock's 1930 version of Seán O'Casey's Juno and The Paycock. ONE OF the all-time great Irish plays, Juno and the Paycock by Sean O’Casey, looks set to thrill Galway audiences from Wednesday June 21 to Sunday 25 in an exciting joint production by Galway Community Theatre and the Town Hall Theatre, under the trusty direction of Andrew Flynn. First staged by the Abbey Theatre in 1924, O’Casey’s play tells the story of the Boyle family who live in a crowded Dublin tenement during the Civil War. Jack Boyle is the self-styled ‘Captain’ and eponymous ‘Paycock’ who works hard to avoid work by skiving in Foley’s bar with constant side-kick Joxer Daly. Jack’s wife Juno is the breadwinner and powerhouse, but she’s surrounded by a family who scarcely deserve her. Son Johnny was maimed during the War of Independence but is dreading a visit from his former IRA comrades while daughter Mary nurses delusions of grandeur. When solicitor Charles Bentham arrives to tell the family that they are due a large inheritance it sets in train the play’s propulsive, rollercoaster, ride that brilliantly blends wild comedy and deep tragedy. Over the past few years Galway Community Theatre - usually in tandem with Galway Youth Theatre - have garnered rave reviews for shows like The Dead School, Frank Pig Says Hello, and Midsummer. Whereas those were by contemporary authors like Pat McCabe and David Grieg, Juno sees the company for the first time take on one of theatre’s enduring classics and a bona-fide ‘biggie’. So, when I dropped by the Town Hall one sunny afternoon last week to meet with both Juno (Patricia Bohan ) and the Paycock (Ger Howard ) in person, their excitement and anticipation around the upcoming show was palpable. Alongside the heart-wrenching tragedy, the play also abounds with exuberant comedy and vivacity. “The humour is great fun, it’s what lifts the play and I’m definitely enjoying the comedy side of it,” Bohan asserts. Tickets are available from the Town Hall Theatre (091 - 569777, wwww.tht.ie ).